A beautiful getaway in the heart of the city. Hartman House was home to Grace Hartman, Sudbury's first female mayor, for many years. Guest Rooms may be rented by the day or for as long as you would like to stay. Up-to-date room availability can be checked online so that you can customize your stay. 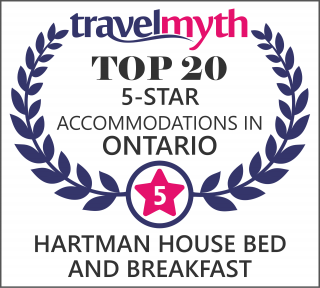 Once you're ready to book, reservations can be made using the online booking system or by calling (705) 566-5762. The most amazing hosts, elegant interior, relaxing atmosphere, marvelous artisanal cuisine. Close to all amenities, transit and located on a major route through the city. Convenience and value. Come here to be treated like a VIP. Highly recommended. 5 Star rating for sure! I highly recommend this quaint bed & breakfast. Jocelyn and Larry make you feel very welcomed. Comfy, clean rooms and delish breakfast. Close to downtown Sudbury, the Boardwalk around Lake Ramsey and Science North. I speak from experience, you will not find a better accommodation! Relaxing atmosphere, beautiful surroundings and dining is superb …5 minutes to a beautiful lake or 5 minutes to downtown shopping .. what more could one need?